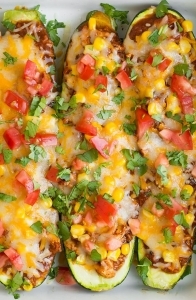 These Unbelievably delicious Chicken Enchilada Zucchini Boats are perfect for weeknight meals. Brush tops and bottoms with 1 Tbsp of the olive oil and place in two baking dishes (I used a 13 by 9 and a 9 by 9). Bake in preheated oven until zucchini is nearly tender, about 20 – 25 minutes. Meanwhile, heat remaining 1/2 Tbsp olive oil in a medium saucepan over medium-high heat. Once hot add onion and saute 3 – 4 minutes until soft. Add garlic and saute 10 seconds longer. Remove zucchini from oven and spoon chicken mixture into zucchini. Sprinkle tops with corn and then cheese blend. Return to oven and bake 5 – 10 minutes longer until cheese has melted and zucchini is tender.